Will Permanent Weight Loss Coaching Work For ME? 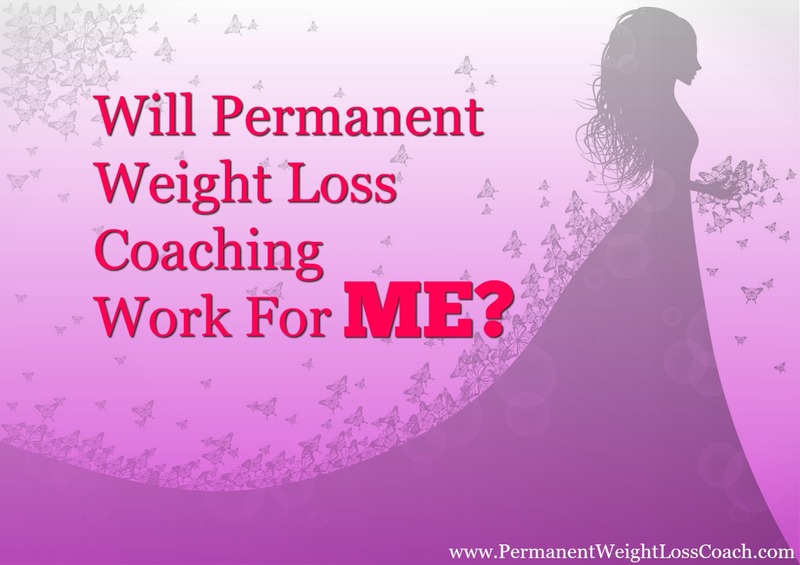 Here’s a question I’ve heard many times: Will permanent weight loss coaching work for ME? The simple answer is sure, why not?! And, the final answer is… it ALL depends on YOU. What does this mean that it all depends on YOU? Does it mean that you are an anomaly, that no one else on the planet is struggling with the shame of secret binge eating? Does this mean that no one else tells themselves “I want to lose weight BUT I can’t stop eating!”. Nope, not at all! In fact there are MILLIONS who right now, as you read these words, are overeating and wishing they could lose weight. Sorry to tell you you’re not unique in you problems with weight loss and emotional eating, binge eating, yo-yo dieting or any other eating disorder or dysfunction you might possibly have. But when it comes to solving your problems permanently, it really does depend on YOU. Here’s a great example based on my personal experience as a permanent weight loss coach: I have an amazing system that works. It heals any unhealthy behavior you can think of that would make the body fat. Whether it’s a negative inner voice that drives you to the frig or a sugar addiction that you think you can’t control, ANY unhealthy behavior can be healed and released with my proven, permanent weight loss coaching system. BUT, it will never work for a person who doesn’t do it. This is what I mean when I say that permanent weight loss depends on YOU. Because, I know that I have the solution that works, I’ve seen it work since I began doing this work in 2009. It always works when the steps are followed because it’s not a new food diet or exercise program. Instead it’s about healing the Inner Self which is where the real problem is that’s making your body fat. But if a person never gets into The Inner Self Diet then they’ll never get the results my clients get. Does this make sense? Can you see what I mean when I say that permanent weight loss coaching works but it all depends on YOU? Because if you never do the proven steps that work, then how can the permanent weight loss coaching system work for you? Do you get it? Does it make sense? Does it also make sense that YOU are the one who guarantees your success with permanent weight loss? Because all you need to do is to Do The Steps that are already proven to work. See how that all works out? Are you getting this? It’s pretty cool, isn’t it. Because there’s no one “out there” anywhere who can stop you from achieving permanent weight loss. You just need the permanent weight loss coaching and the proven system that goes along with it to achieve your success. Do You Want The Solution for Permanent Weight Loss? If you want the solution to permanent weight loss then keep reading! If you don’t want the solution that will give you permanent weight loss then stop reading and please DO share this post with your friends! Go ahead and use the social media buttons on this page and you’ll be doing your friends a great service. You probably don’t even realize how many people you know directly or indirectly through social media who are struggling daily with food and their weight. They’re feeling really depressed because they think that they’re lazy because they can’t stick with their weight loss program. What they don’t know is that they’re looking in the wrong place to solve their problem. When you share this post with them they just might get a paradigm shift that will help them out! Now for YOU who is still reading because you want the solution to permanent weight loss, here’s your first step: click here to get in line to apply for a complimentary weight loss discovery session with me. The complimentary discovery session will help you gain clarity on where you are vs where you’d really love to be while taking a look at what’s really stopping you from losing weight for good. But you need to apply now if you’re serious about achieving permanent weight loss in the least amount of time possible. My schedule is not unlimited and only those applications that are approved for the free call will get an appointment. Please make sure you’re serious about achieving permanent weight loss before applying. If you’re more dedicated to continuing to struggle then it’s better you don’t apply. This is for you if you’d love to stop wondering why you’re so smart and successful professionally BUT you can’t get it together with your weight. Click here to get started now!